Build a linear combination of probability density functions. The collection of distributions wich compose the linear combination. A sequence with each component , of dimension equal to the size of collDist. The collection of weights applied to the collection of distributions. By default, the weights fulfilled inside each distribution are used (if any), thanks to the method collDist[i].setWeight(myWeight). If not set, the weights are all taken equal to 1. The weights are automatically normalized so that their sum is equal to 1. Compute the sequential conditional cumulative distribution functions. Compute the sequential conditional derivative density function. Compute the sequential conditional probability density function. Accessor to the distribution collection. We consider an absolutely continuous measure with density function . The bilateral confidence interval is the cartesian product where and for all and which verifies . CDF value(s) at input(s) . 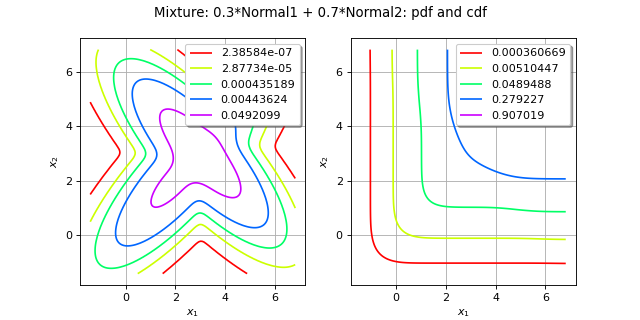 Partial derivatives of the CDF with respect to the distribution parameters at input . Characteristic function value at input . 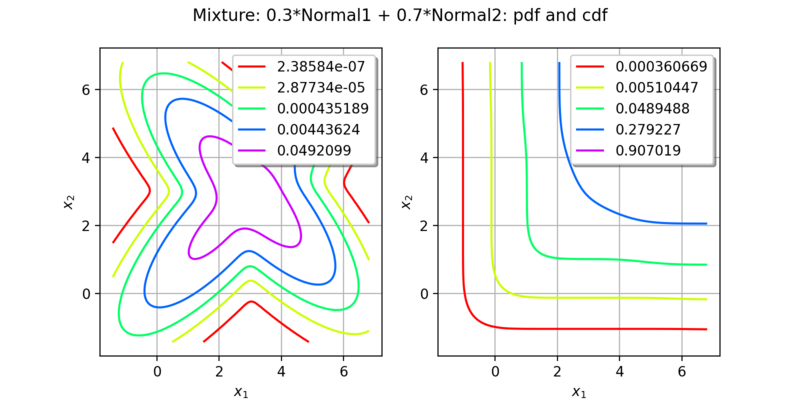 OpenTURNS features a generic implementation of the characteristic function for all its univariate distributions (both continuous and discrete). This default implementation might be time consuming, especially as the modulus of gets high. Only some univariate distributions benefit from dedicated more efficient implementations. Complementary CDF value(s) at input(s) . Conditional CDF value(s) at input , . Conditional DDF value at input , . Conditional PDF value(s) at input , . Conditional quantile at input , . DDF value(s) at input(s) . Density generator value at input . Density generator first-order derivative value at input . Density generator second-order derivative value at input . Probability-generating function value at input . Logarithm of the characteristic function value at input . Logarithm of the probability-generating function value at input . Logarithm of the PDF value(s) at input(s) . Partial derivatives of the logPDF with respect to the distribution parameters at input . To find , we use the Brent algorithm: with a non linear function. PDF value(s) at input(s) . Partial derivatives of the PDF with respect to the distribution parameters at input . Quantile at probability level . CDF value at input . Values to be taken sequentially as argument and conditioning part of the CDF. Conditional CDF values at input. ie its -th component is the conditional CDF of at given that . For it reduces to , ie the CDF of the first component at . Values to be taken sequentially as argument and conditioning part of the DDF. Conditional DDF values at input. ie its -th component is the conditional DDF of at given that . For it reduces to , ie the DDF of the first component at . Values to be taken sequentially as argument and conditioning part of the PDF. Conditional PDF values at input. ie its -th component is the conditional PDF of at given that . For it reduces to , ie the PDF of the first component at . Values to be taken sequentially as the argument of the conditional quantile. Conditional quantiles values at input. where are defined recursively as and given , : the conditioning part is the set of already computed conditional quantiles. The left unilateral confidence interval is the cartesian product where for all and which verifies . It means that is the quantile of level of the measure , with iso-quantile components. The right unilateral confidence interval is the cartesian product where for all and which verifies . It means that with iso-quantile components, where is the survival function of the measure . if the distribution is elliptical, then the transformed distribution is simply made spherical using the Nataf (linear) transformation. if the distribution has an elliptical Copula, then the transformed distribution is made spherical using the generalized Nataf transformation. otherwise, the transformed distribution is the standard multivariate Normal distribution and is obtained by means of the Rosenblatt transformation. Componentwise moment of order . Componentwise standard moment of order . weightsPoint with each component . weightssequence of float with each component .